The design was manufactured on a Renishaw AM250 metal additive manufacturing system from stainless steel. The design was manufactured on a Renishaw AM250 metal additive manufacturing system from stainless steel. 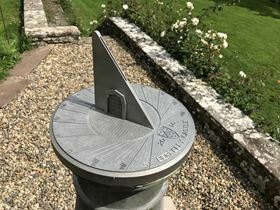 Once completed, the sun dial was mounted on to the empty pedestal using a specially designed mounting unit, ensuring correct alignment with the sun. The design incorporated specific features to link the sun dial to Berkeley Castle, including the Berkeley Arch and Door in the design of the gnomon (vertical piece) and a moat and cobbled courtyard on the dial face (horizontal piece).